Experience an amazing new sport in the Philippines — Stand Up Paddle — amidst the natural beauty of Lake Caliraya in Laguna! Stand-Up Paddle (SUP) is an offshoot of kayaking and surfing. Like a kayak, you’re primarily moving via paddle power. Like a surfboard, you’re standing on the board. It’s a physical challenge that allows you to explore rivers, lakes, inlets, and other bodies of water in a personal and intimate way. Lake Caliraya in Laguna has been recognized as one of the best spots in Luzon for watersports, with a fully equipped windsurfing and kiteboarding school already in operation. The advantage: the fact that it’s a lake with relatively flat water with no swells. This allows SUP to happen almost 12 months of the year. Soloviento uses some of the best SUP boards in the industry — by Australian manufacturer JP. In addition, our trainers are extremely familiar with Lake Caliraya, and can make sure you get the right instruction to get you started. Soloviento also has room accommodations, a campsite, clean bathrooms and a fully functioning restaurant. You’ll never have to hop venues once you’re here. 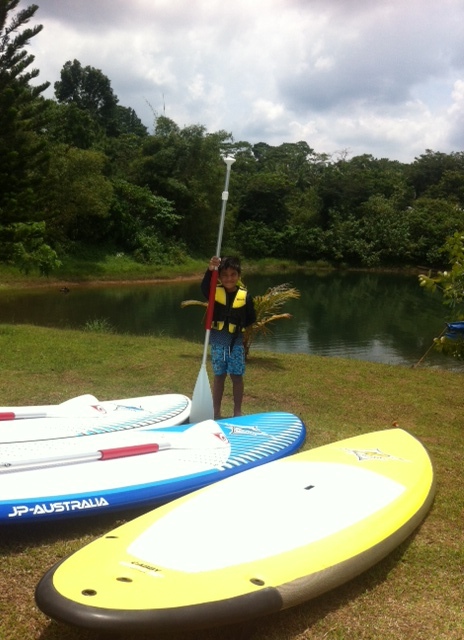 Santino, our youngest SUP rider! Learn how to stand up paddle. Go from a kneeling to standing position. Steer and pilot the board. Safety basics: leashes and vests. 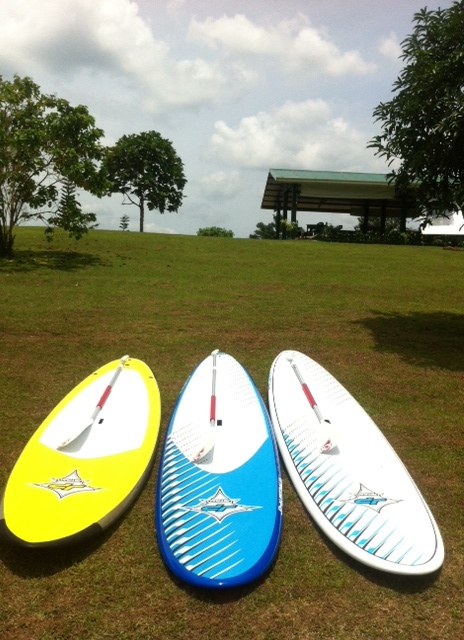 A 90-minute SUP tour down one of Lake Caliraya’s “rivers”. Enter a quiet natural natural sanctuary. Glide past vacation houses behind the treeline. Strongly suggest you do the “Learning the Basics” session first. We may charge an additional P300/person for Tour #1 if the wind conditions are strong and you may be boated to a starting point.